Is dog training necessary? You bet it is. Any new dog owner needs to know a little about training even before they bring their rescue or puppy into their home for the first time. Don't wait until your dog is driving you nuts! No puppy comes into the world knowing how to live with us humans. They are a completely different species, even though we often think of them as our furry children. They have their very own species-specific behaviors that may clash at times with our own. Puppies need to learn what is acceptable. They need to be taught what to do, just like we teach our own human children. They need to understand what is appropriate when out and about. They need to understand how a "good dog" behaves. They need to feel comfortable around a wide variety of people, other animals and different places. 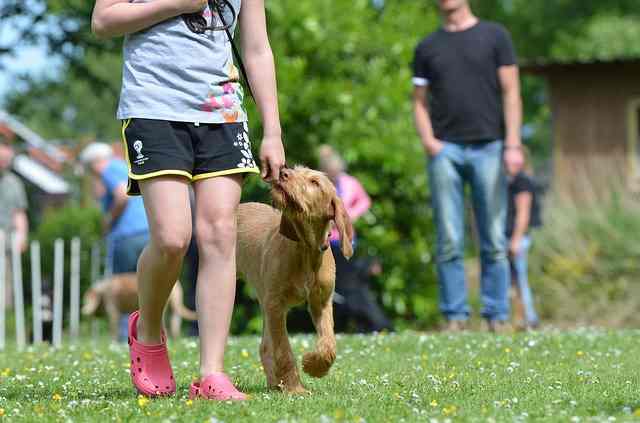 There are a number of dog training methods used today, some better than the others. There are, however, two major camps when it comes to training: First, their are methods that rely on positive reinforcement and secondly, some trainers rely on methods that depend on punitive techniques. Historically, people depended on punishment to train their dog. They relied on the theory of dominance, where you, the human was the alpha member. We now know there is a better way. Positive training is based on science - learning theory and psychology. It is more efficient and you see results faster. It is also an excellent way to develop a strong bond with your dog. One of the best ways to start your training program with a young puppy is to get out and socialize them. These early experiences give the dog a sense of confidence that will lead to a successful training program. There is some basic equipment that you will need before beginning your training. It is best to purchase some of these before the puppy arrives because they should begin training the day they arrive at your house. Dogs bark. Barking is one of the ways dogs communicate with us. When it becomes excessive it is time to do something to reduce the annoyance. In this article, guest author, Kevin Davies, discusses when a dog bark collar could be warranted and how to use it in your training program. If you are having an issue with your dog barking excessively this might be your solution.